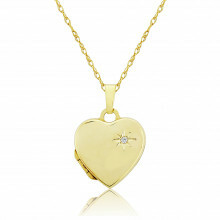 Beautiful and meaningful, a Locket is a precious, treasured gift. A picture frame, a memento and a symbol of personal, individual remembrance. 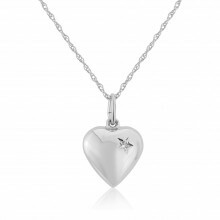 This pretty polish heart Locket has a soft satin-look finish on the back and a single twinkling Diamond in a starburst setting. The Sterling Silver chain can be worn at 16” or 18”.